Boxhead is a flash game where you just need to shoot all the zombies that comes at you. You can choose from a variety of different rooms to wander around in and then you just shoot away. As you progress you collect more weapons (ala Doom style) and more and more zombies attack you. My top score is 852,200. The name of the game is Dodge. The goal in this game is to, um, dodge. 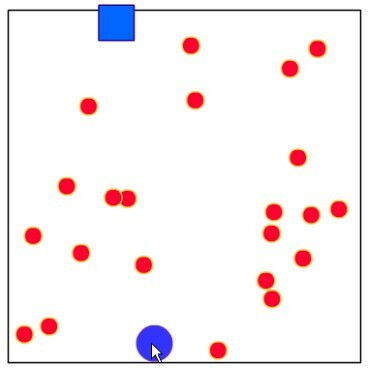 What you need to do is move the blue ball with your mouse to touch the blue square, while avoiding the red balls. Every time you touch the blue square another red ball is added, making the game harder. I got 125 points, how about you? 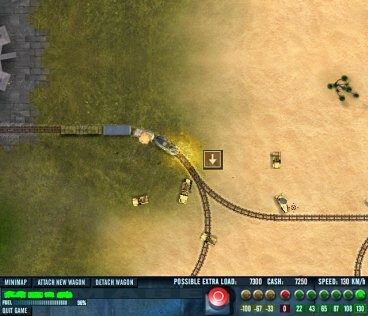 Rails of War is a combination of a railroad game and war game. You control a train that is loaded with weapons (nothing like a shooting train :) and you need to achieve various goals in your enemy's territory (pick up things, drop them off, repair your train...). In the mean time, your enemy keeps coming at you with tanks, planes, and other military vehicles, in order to try to shoot your train out. The graphics are pretty cool and it's a real fun game to play.